We are happy to answer any questions you may have. Please feel free to contact us for more information. Plymouth Light Station is located in the Town of Plymouth. The best time to visit the light is on the day of the annual Open House. This is held on the Saturday before Memorial Day. It is a big event with organized tours and interpreters who explain the history of the light station and Fort Andrew. Visit our web page for details in upcoming events section. 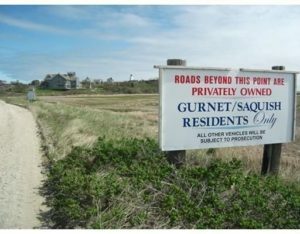 If you cannot join us for the annual Open House, you can walk, bike, or drive to the Gurnet. The light is only accessible through the adjacent Town of Duxbury. Cross the Powder Point Bridge to Duxbury Beach and turn right at the Harbormaster’s shack. If the shack is manned, inform the officer that you are going to the lighthouse. (Duxbury Beach requires a beach permit but the road to the lighthouse is a public thoroughfare.) Drive five miles on the unpaved road. It may be very bumpy. You will cross into the Town of Plymouth. Ahead you will see the lighthouse. Although the Plymouth Light Station site is owned by the U.S. Coast Guard, it is surrounded by private property. Even the roads are privately owned. On the right you will see the sign pictured. If the security post is manned, speak to the staff and inform them that you would like to visit the lighthouse. If given permission proceed ahead passing the first road on your right which goes to Saquish. At the second road turn right. Proceed until you see the large grey building with the red roof. (The former Gurnet Lifesaving Station.) Make a hard left and proceed ahead to the gate and park. On the right is the white Keepers Cottage which is available for rentals. Do not park on the paved lot or driveway as this is reserved for our renters. We do have some volunteers who give tours by pre-arrangement. If you would like to request this, please use the form above to submit a request. Duxbury Pier Light sits on a rock pile in Plymouth Bay. It is not open to visitors as it is too dangerous. It can be seen from the Plymouth waterfront and the breakwater. Tour boats in Plymouth provide a closer view. Visit Captain John Boats in Plymouth or call (508) 927-5579.